Take a tour around our shiny new website! 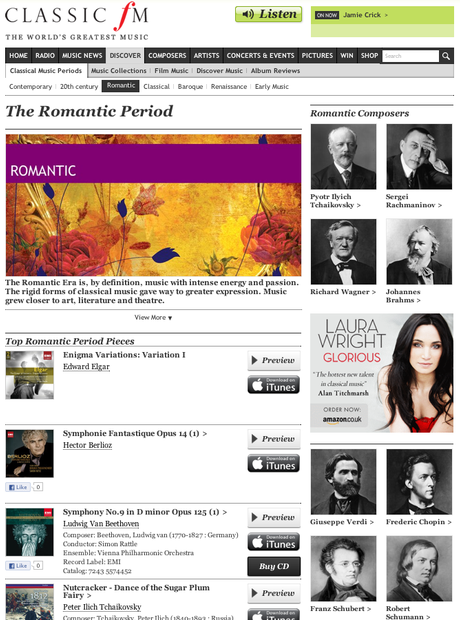 Learn about all the different eras of classical music, listen to the best pieces and find out who was composing when. Trying to find out the name of the piece you heard earlier? Our new playlist allows you to jump to the exact time and date you heard it, listen back to the piece and find out where to get hold of it. Read about the biggest artists in classical music, find out their story and even watch them in action! Check out our composers section to find out everything you need to know about the people behind the world's greatest music and hear excerpts from their finest works. Discover the stories behind all your favourite pieces and watch the world's finest musicians perform them!